We're pleased to share with your three new face masks combining nourishing herbs, mineral-rich clays and precious essential oils for an ethereal at-home spa experience! Part of Wild Rose's Attunement skin care line. This restorative mask combines mineral-rich Rhassoul Clay with gently exfoliating Rose Petals for a blissful spa experience. Enhanced with organic essential oils of Carrot, Rose Geranium, Pacific Northwest Lavender, Lemongrass and Helichrysum. This unique blend will nourish skin and fill your bathroom with a floral-sweet, yet earthy therapeutic aroma. 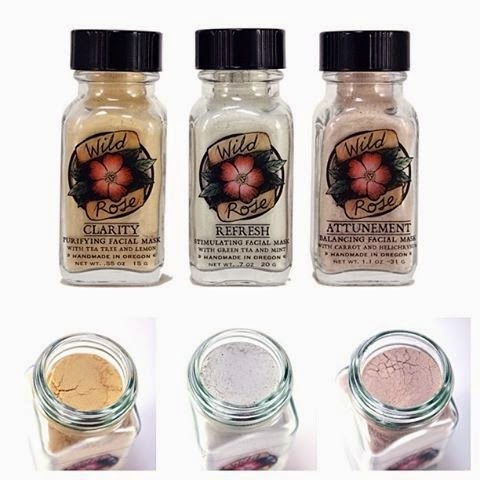 Part of Wild Rose's Clarity skin care line. This gently purifying mask combines detoxifying French Yellow Clay with exfoliating Witch Hazel Bark for an effective, yet enjoyable spa experience. Enhanced with organic essential oils of Tea Tree, Pacific Northwest Lavender, Lemon Peel, Carrot Seed and German Chamomile. This unique blend will purify skin and fill your bathroom with a calm herbacious, lightly floral therapeutic aroma. A rejuvenating blend of toxin-drawing French Green clay, stimulating Gunpowder Green Tea and gently exfoliating organic Jasmine Petals. Enhanced with organic essential oils of Peppermint, Lemon, Pacific Northwest Lavender and Carrot. This unique blend will invigorate tired skin and fill your bathroom with an energizing therapeutic aroma.